.50 carats total weight of diamonds are set in this 14K bi-color gold antique style earrings. Both the upper and lower portions of the earrings are crafted of white gold while the central lattice portion of the earrings is made of yellow gold. 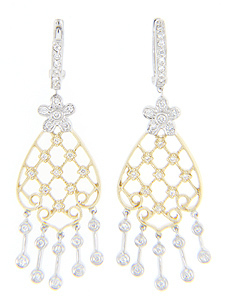 The earrings are covered with diamonds set in prominent locations. The earrings measure 1 7/8” in height by 5/8” in width.